 Thick stands, shade out low level native plants reducing diversity and denuding riverbanks of understory vegetation.  Winter dieback exposes soil to erosion. Greater nectar production makes flowers more attractive bees resulting in less pollination of native species. Quite a daunting climb out of the river. Himalayan Balsam has many drawbacks. 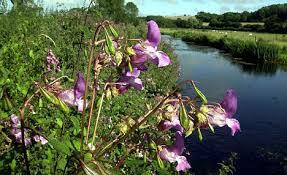 Hymalayan Balsam … undermining our river banks. In simpler terms, Himalayan Balsam will result in other plants being reduced or dying out on our river banks exposing them to increased erosion with increased silt in the waters. 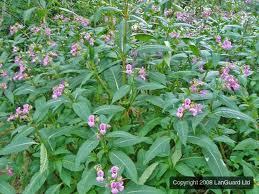 Himalayan Balsam is an annual plant and therefore the key objective for control of Himalayan Balsam is to exhaust the plants seed bank. This is done by repeatedly removing adults before they set seed. Seed bank longevity is about two years and control programmes should be undertaken for the whole of this period followed by a 5 year monitoring programme. It may also be necessary to consider a bankside rehabilitation programme to prevent erosion. Cutting or grazing can also achieve control but cutting should not be attempted once the seed heads have formed, as this would effectively spread the plant. Continual monitoring should be undertaken to prevent reseeding as cut plants can regrow. The first monitoring visit should be timed shortly after cutting, as Himalayan Balsam has been known to re-grow within weeks of control. By hand pulling is an effective way of removing adult plants in small areas and is more environmentally friendly than chemical control. Care should be taken to remove the whole plant as plants can regrow within the same season if cut and not fully removed. If everyone pulls up some plants each time they visit the river bank we CAN beat this stuff. All anglers are able to contribute to control throughout the season by pulling 5 (or more) plants on each visit to the river, and if we encourage dog walkers etc. to contribute we can make a difference. OR we could just sit back, decide it’s too difficult and leave it to someone else. You know ” they should do something about it!” … but who are THEY? Plants should be pulled up by the roots, before seed pods are formed; the stem should then be snapped and completely separated by from the roots. Once this is done stack the dead plants together in one place, do not disperse the plants as this will risk spreading any seeds already present. We may not be able to clear the plant completely from our waters and it will take time to see meaningful results, but if we make the effort we can make a difference, protect those banks and improve the river habitat which helps trout to develop and produce clearer waters for migratory fish to run. If Willington Club can make a difference we call also ask Wear Anglers Association to take part along the full length of the river which will help to make a real difference to those river conditions, including spanning grounds, for Sea Trout and Salmon.